For access to Nanette Pezzutti's full information you must be on Nanette's Trusted List. Please login. See the Contact section of the Tree & Tools page. Nanette Pezzutti is a Wonderful WikiTreer Jun 14, 2018. Nanette Pezzutti is a Wonderful WikiTreer Jan 1, 2018. Nanette Pezzutti is a Wonderful WikiTreer Dec 20, 2017. Nanette Pezzutti is a Wonderful WikiTreer Dec 9, 2017. Nanette Pezzutti is a Wonderful WikiTreer Jun 12, 2017. Thank you for finding the 1910 census information for Minnie Moseley and Co.! That touched off an evening of updating biographies and adding sources for the whole bunch, and brought a discrepancy to my attention that I need to investigate further. Thank you so much! I noticed that you are using the Challenge Tracker for unsourced corrections in this past weekend's Saturday Sourcing Sprint. If you would like to have your totals kept individually on the Sprint Tracking Sheet (https://www.wikitree.com/wiki/Help:Saturday_Sourcing_Sprints#Tracking), be sure to add an answer (not a comment) to the most recent Saturday Sourcing Sprint G2G thread (https://www.wikitree.com/g2g/tag/sourcing_sprints). Team membership is not required. No pressure, every profile with a source makes our WikiTree better. Your work will be included in the Unregistered total at the bottom if you do not register. Thank you for the information. Feel free to comment on my family tree. Nanette (Gahn) Pezzutti is a Wonderful WikiTreer. Thank you for the addition you listed. Also my mother was a Gahn, full blooded German. Interesting you are from the Gahn's also. We have not followed her line, just the Meredith's. Thank you for ask your help with the Parker family. Hi Nanette. Thanks for your help. Yes I was married in Pinellas park Fla. To Dorlis Diand Slawson. Hi Nanette. As I think you discussed with my brother Ted, Barry is our uncle through marriage. Nice to make the connection with your Luddens! Nanette, I appreciate for the comments you include when making changes to profiles. Thank You!!!! Thank you Nanette, for your help with Myrtle Cranes profile, and bringing families together! Thank you for your suggested merge on Myrtle Crane! to the top of your biography if you speak English natively, intermediate French and basic Irish, or you could use de-4 to specify near-native German or ru-1 for basic Russian, and so forth up to ten languages. Thank You so very much for the It. to Eng. translation of Anna's birth record. You and Sharon gave different interpretations/translations and now I could not live with just one. I am so happy! Thank You! This fo posting grave marker many of my mothers relatives are buried there and at St. John he baptist in Dayton Minnesota. Next to Osseo. Thanks again for the added information on many of my ancestors profiles. You're very much appreciated for doing this. Oh my gosh!!! No-one ever spoke about this child you found that passed away at an early age. My dad as far as he knew had a sister and it was only him and her! My dad also said he never knew his dad (my Grandpa), and I believe him because I never met him. Obviously Grandma never spoke about losing this child to my dad. I am trying to find info on my Grandma and Grandpa's parents, parents and so forth. I have come to a dead end as you will see looking at my Dad's side family tree. I have no idea who Roscoe's parents were either. Any help would be appreciated! Thanks so much for finding this tid bit of information on this child in the family. Thank you Nanette for adding valuable information to many of my ancestors profiles. The mysterious pgm refers to the name of the WikiTree "Puritan Great Migration" project. See Project:Puritan Great Migration for more information, including why "Puritan" is included in the project name. And since you are interested in researching ancestors in that population, you ought to join us in that project! Thank you for merging Charles Strong so quickly. I have just started becoming interested in my ancestors. This connection will help immensely. I see you'll be participating in the Source-a-ton next weekend. If you haven't yet joined a team, will you consider the Forget-me-nots? With ancestors from New York, Pennsylvania, Massachusetts, Maine, Canada, and Ireland, a generic team seems like a perfect fit. Keep up the great sourcing! Thanks for the sources on Harry Coursen !! Dear Nanette thank you for the information you posted for Alletha Pinkney (Miller-29929) Henry and also on her father's. My apologies for the delay in responding but has been a hectic couple of weeks here. Hi, Nanette! Thanks for all your work to add sources. Please don't remove the <references /> tag from profiles - that is what displays the list of references included in the biography section. Thanks! Hi Nanette! Thank you for your involvement in Italian Roots. If you use Google+, please join our community there, too. It's just getting started but it's a useful way to coordinate a project. Nanette, it was researched by Joe Foss (Foss-1457), who is a family member. Joe was related to Eunice Foss, London's wife. Hello Nanette, thank you for your message.The Danks in my tree comes from my mother who was Edna Annie Danks before her marriage to my father. Her father was born in Tipton which was in Staffordshire but now is in the West Midlands after the boundary changes several years ago. London Atus died in 1843 in Machias, ME not 1855. My name is Guy, Mentors leader. We are looking for Wikitree members having the hability to help others and you were refered by another member. Thank you, Nanette, you're very kind! Hi Nanette, my grandmother was a Tobey, and a while ago I linked up a lot of scattered descendants of the immigrant Thomas Tobey. I just connected your Henry Tobey back to Thomas, using the website of Sandra Ball, whom I know to be a careful researcher. For the profiles of Henry's immediate Tobey ancestors, if you want I'd be pleased to make you the manager and delete myself as manager. Hi Nanette. Great to see you adding some Whittens. :-) And coincidentally, my aunt Holly Whitten married a man named Barry Ludden. I'm not sure of my uncle's Ludden genealogy but since he's from Massachusetts and it's an unusual surname, I'd bet there is a connection somewhere. Sure, Nanette! Sorry-I need to fine tune my tally system for Sourcerers :-) Will get that updated shortly. Thank you Nanette, for submitting what I hadn't had time to do yet. She is my grandmother, and I was a pall bearer at her funeral. I'm also a teacher, and with school beginning, I have been extremely busy! Thank you for updating my information! Well neat, Samuel is my 3rd cousin, 6 times removed. I've only gotten as far down as Tappan in baptism records so perhaps there will be something more solid to tie Samuel to Benjamin in the future. Well done on the Stratton family, Nanette! Thanks for taking the time to add them. Also, you might want to set your Privacy to Private with Public Family Tree. The WikiTree programming needs to see your Family Tree tab to make DNA and other cousin connections for you. Please take a look at my profile http://www.wikitree.com/wiki/Cooper-1 where I use Private with Public Biography AND Family Tree to see a list of some of my WikiTree cousin connections and my list of U.S. Presidential cousins. Thanks for your note. You might be interested in joining the US Presidents Project because of your Coolidge connection, or the 1776 Project because of your Revolutionary War ancestors. You created that cemetery category for your grandfather perfectly, apart from it needing to be a subcategory of Category: Monmouth County, New Jersey, Cemeteries, which is done now. You can remove your grandparents from the Category: Monmouth County, New Jersey, Cemeteries as they are already in its subcategory, Category: Monmouth Memorial Park, Tinton Falls, New Jersey. Good luck with connecting your family to the big tree. I see that you just did the Pre-1700 Self-Certification. That's great! Is there a particular time period, location, or topic you're interested in? Maybe you have some historically-significant ancestors? Let me know. I can help you figure out if there's a project and introduce you to the project leaders. Thank you for joining WikiTree. I'm a WikiTree Mentor available to answer any questions or help solve any issues you may have. If you have any questions, feel free to ask me via my profile page. It's great that you are Volunteering! 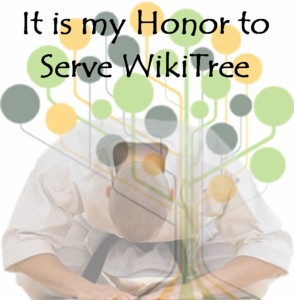 You are now a member of the WikiTree Community. Please note we are trying to build one Collaborative Tree which means one profile per person. It is important to ensure no duplicates are entered as you add any Profiles to WikiTree. If you need any help getting started check out the help section from the menu, top left, or head over to the G2G forum and take a minute to introduce yourself in the Tree House, you might also want to check out the introductory WikiTree video that a member created. Experienced genealogist with years of research and transcription expertise. Just to mention that you may want to create a profile in your own surname, since this enables your profile to find its rightful place in our family tree. Our naming conventions can be found at Name Fields. Nanette is 41 degrees from Graham Chapman, 23 degrees from Janet Wild and 20 degrees from Henry VIII of England on our single family tree. Login to find your connection.